Contact Spray Foam Orlando to begin the process of energy savings, energy efficiency, and a reduced carbon footprint in the Orlando, Florida market. We will come to your home or business for a free spray foam estimate, and further advice on how to improve your home's efficiency. 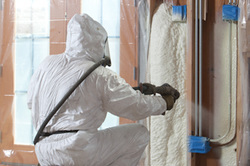 Call Spray Foam Orlando today at 407-641-2746 to take the first step toward a greener tomorrow! Our goal is to provide the greatest value to our clients, and always at a competitive price in the market. We have found this combination to be an exceptional way to add value to our clients' homes and structures. Also, you can always fill out the quote form which you will always find on each page of our site for a free quote. There is no charge to visit you at your home or business and discuss all the options for spray foam in Orlando, FL, and how we can help you save money today.